Mint Leaf uses their own specialised couriers to deliver their food. 1 x Samosa (2 Pcs), 1 x Chicken Tikka (2 Pcs), 1 x Lamb Seekh Kebab (2 Pcs), 1 x Butter Chicken, 1 x Lamb Rogan Josh, 1 x Daal Tadka (Our Popular Yellow Daal), 2 x Rice, 2 x Naan, 1 x Raita, 1 x Papadams (4 Pcs), 1 x Mint Sauce. Short pastry pockets filled with potatoes, green peas and deep fired. Onion rings battered and deep fried. Seasonal vegetables dipped in spicy batter and deep fried. Vegetable samosa topped with tangy sweet and sour sauce, garnished with mint sauce, onions and yoghurt. Mushrooms marinated in yoghurt, spices and cooked in tandoor. Lamb mince, marinated with spices, fresh herbs, rolled on a skewer and cooked in tandoor. Cubes of cottage cheese marinated in yoghurt, fresh herbs and spices and cooked in tandoor. This mouth-watering fried fish prepared with lot of spices is a popular street food of Amritsar. Boneless chicken pieces marinated in spices, yoghurt spices and cooked in tandoor. Boneless chicken marinated in spices, battered and deep fried. Tender lamb cutlets, marinated in yoghurt, fresh herbs and spices and cooked in tandoor. Whole chicken marinated in yoghurt, authentic spices and cooked in tandoor. A maharaja delight, King Prawns marinated in yoghurt masala and deep fried. 2 pieces each of chicken tikka, seek kebab, tandoori chicken, lamb cutlets. Seasonal vegetables cooked with medium sauce. A dry preparation of fresh vegetables with herbs and spices. Seasonal vegetables cooked with mild spices sauce. Vegetables cooked in hot and tangy spicy sauce. Potatoes cooked with fresh spinach and mild spices. Potatoes and peas cooked in onion and tomato based curry. Potatoes and cauliflower cooked with fresh herbs and mild spices. Mushrooms and green peas cooked in mild onion based gravy. Black lentils and kidney beans simmered slowly overnight, cooked with freshly ground spices, cream and herbs. Yellow lentils cooked with fresh herbs and mild spices. Eggplant cooked with potatoes, herbs and medium spices. Yellow lentil cooked in fresh spinach. Cottage cheese deep fried, cooked in cream and butter sauce. Cottage cheese, cooked in tomato, onion and capsicum and mild spiced. Cottage cheese, cooked in tomato, onion and capsicum finished with cream. Cottage cheese cooked with peas and mild gravy. Cottage cheese and spinach cooked in mild spices. Cottage cheese and potato dumpling, deep fried and cooked in mild gravy with dry fruit and nuts. Selected garden potatoes stuffed with cottage cheese and dried fruit and nuts and cooked with mild tomato and onion gravy. Boneless chicken pieces cooked with home-made butter sauce. Boneless pieces of chicken cooked in an exciting mild cream sauce with nuts and sultanas. Boneless chicken pieces cooked with mild cashew nut gravy. Authentic chicken curry from the foot-hills of Kashmir. Tender chicken pieces cooked in chillies and hot spicy sauce. Boneless chicken pieces cooked with mushrooms and mild spices. Boneless chicken pieces cooked with onions, capsicum and medium hot spices. Boneless chicken curry with chickpeas and garam masala garnished with green chilli and coriander. Chicken tikka cooked with onion, capsicum and fresh herbs. Chicken cooked in mild spinach puree. Boneless chicken curry cooked in mild lentil curry. Chicken cooked with chillies, curry leaves, coconut cream and mustard seeds. Boneless chicken cooked with capsicum, onion, tomato and freshly ground herbs and spices. Boneless chicken sautéed with green chillies, onion, tomato and spices. Authentic lamb curry from the foot-hills of Kashmir. Boneless lamb pieces cooked in mild cashew nut sauce. Lamb cooked with onions, capsicum and medium hot spices. Seek kebab cooked with onion, capsicum, fresh herbs and spices. Boneless lamb curry with chickpeas and garam masala garnished with green chilli and coriander. Lamb cooked in chillies and hot spicy sauce. Boneless lamb cooked with mild lentil curry. Lamb cooked in mild spinach gravy. Lamb cooked with curry leaves, coconut cream and mustard seeds. Well-seasoned lamb in authentic spices, cooked with onions and tomatoes in a thick gravy. Medium spicy dry lamb curry, pan fried with a combination of spices. Chef's special, goat meat cooked on bone with traditional Indian medium curry sauce. Goat cooked with onions, capsicum and medium hot spices. Authentic beef curry from the foot-hills of Kashmir. Boneless beef pieces cooked in mild cashew nut sauce. Beef cooked with onions, capsicum and medium hot spices. Boneless beef curry with chickpeas and garam masala garnished with green chilli and coriander. Beef cooked in chillies and hot spicy sauce. Boneless beef cooked with mild lentil curry. Beef cooked in mild spinach gravy. Beef cooked with curry leaves, coconut cream and mustard seeds. Medium spicy dry beef curry, pan fried with a combination of spices. Diced beef dedicated cooked with potatoes, coconut milk, fresh ginger and garlic. Meat balls cooked with mushrooms in golden gravy with a combination of medium spices. Tender morsels of beef cooked in kadai (Indian wok) with array of spices. Cubes of Ling fillets, delicately seasoned and prepared in a typical Goanese style with a touch of lemon and coconut cream. Fish simmered in rich tomato gravy with yoghurt, cream, cashew nuts and floured with fenugreek leave. Boneless fish fillets cooked in mild spices. Fish cooked with onions, capsicum, tomato and medium hot spices. Boneless fish fillets cooked in chillies and hot spicy sauce. 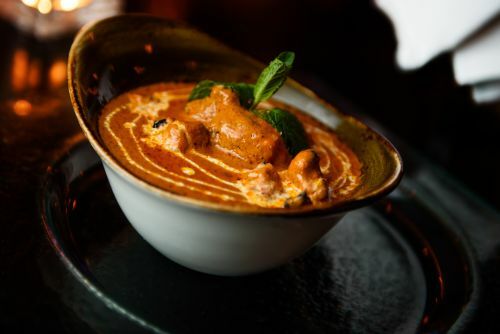 Prawn simmered in rich tomato gravy with yoghurt, cream, cashew nuts and floured with fenugreek leaves. Prawn lavishly cooked with fresh curry leaves and mustard seeds in a coconut flavoured creamy sauce. Prawns cooked with mild cashew nut gravy. Prawns cooked in mild spices. Prawns cooked with fresh spinach and mild spices. For hot taste buds, prawns cooked in chillies and hot spicy sauce. Prawns cooked with onions , capsicum, tomato and medium hot spices. King prawns sauteed with onions, tomatoes, capsicum and chillies garnished with fresh ginger and coriander. Basmati rice cooked with saffron. Rice cooked with green peas. Rice cooked with coconut in traditional south Indian style. Rice cooked with dry fruits and nuts. Rice cooked with boneless lamb pieces. Rice cooked with boneless chicken pieces. Rice cooked with prawns and mild spices. Plain flour bread cooked in tandoor. Plain flour bread finished with garlic. Flaky naan finished with butter. Naan bread stuffed with mild cottage cheese and potatoes. Naan filled with fresh mozzarella cheese and capsicum. Naan bread stuffed with minced meat and herbs. Naan stuffed with dry fruit and nuts. Wholemeal bread stuffed with peas and potatoes. Combination of naan, aloo paratha, paneer naan and keema naan. Home-made mango flavoured Indian ice cream. Home-made pistachios flavoured Indian ice cream. Full cream milk dumplings in sweet syrup. Restaurant’s special mango flavoured sweet yogurt drink. Don't miss it!